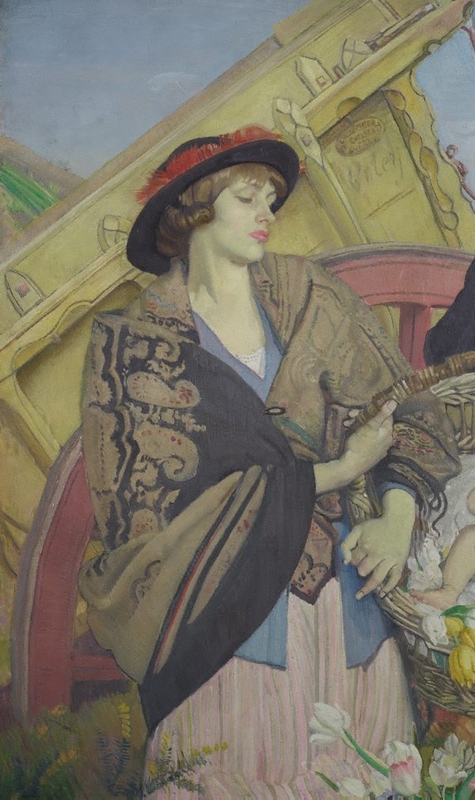 … Mr Lambert stated that a slight allegory might be suggested by the composition of his work, as it represented motherhood and the future generations, the fighting forces of the world and the administrative qualities, without which the world (the red cart wheel) would not go round smoothly. 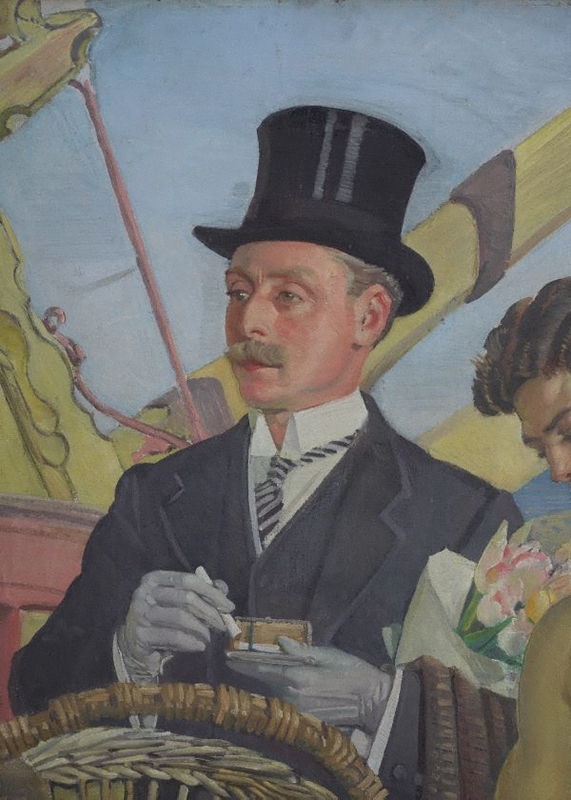 By creating a portrait of ordinary people - a flower-seller, a clerk and a boxer - George W Lambert sought to parody the convention of only those with wealth or social status having their portraits painted. He questioned social values by mixing people of different social classes. While Lambert's approach was formalist, emphasising design and composition, his subject reflected various interests of the day as well as his acquaintance with Irish playwright George Bernard Shaw, whom Lambert particularly admired for his ridicule of social snobbery. Signed upper c., green oil inside an oval "G.W.LAMBERT/ ...". Not dated. Art Gallery of New South Wales annual report 2005 , Sydney, 2005, 18. Maurice Brodzky (Editor), Table talk , Melbourne, 15 Apr 1921, page unknown. 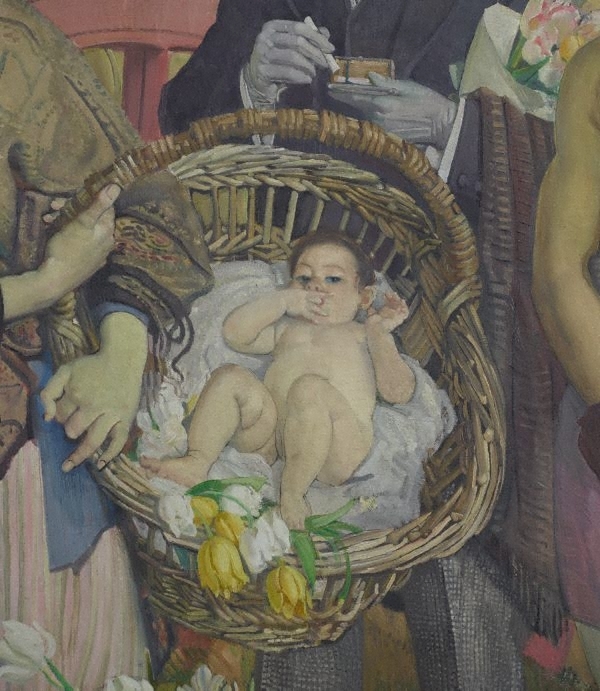 Candice Bruce, Brought to Light: Australian Art 1850–1965 from the Queensland Art Gallery collection , 'Family and a Special Friend. George Washington Lambert Portrait group (The mother)', pg. 102-7, Brisbane, 1998, 107. Sarah Engledow', The world of Thea Proctor , 'The world of Thea Proctor', pg. 16-84, Canberra, 2005, 39.
puzzle painters: Quaint humour at the Grosvenor Gallery'., Daily express , 'New conundrums, London, 16 Apr 1914, page unknown. Exhibition review of the International Society's 1914 exhibition. Art and Artifice: George Lambert (1873-1930) , 1996. Thirty years of an artist's life : the career of G.W. Lambert, A.R.A , Sydney, 1977, 54, 55. William Moore, The story of Australian art from the earliest known art of the continent to the art of today (Vol. 1) , 'Galleries', pg. 179-214, Sydney, 1934, (illus.). Barry Pearce, Look , 'New Look for 20th Century Australian Galleries', pg. 13, Heidelberg, Nov 1998, 13. Barry Pearce, Australian art: in the Art Gallery of New South Wales , 'Introduction', pg. 10-16, Sydney, 2000, 14, 15 (colour illus. ), 96 (colour illus. ), 301. Transformations in Australian art: The nineteenth century - landscape, colony and nation [Volume One] , 'Landscape with feeling: Golden summers and modern life', pg. 107-123, St Leonards, 2002, 119. Wayne Tunnicliffe and Deborah Edwards, Look , ‘New Australia’, pg. 24-27, Sydney, May 2012, 24, 26 (colour illus.). In our own image: the story of Australian art , Sydney, 1995, 85 (colour illus.). Editor Unknown (Editor), Bulletin , Sydney, 01 Sep 1921, page unknown. 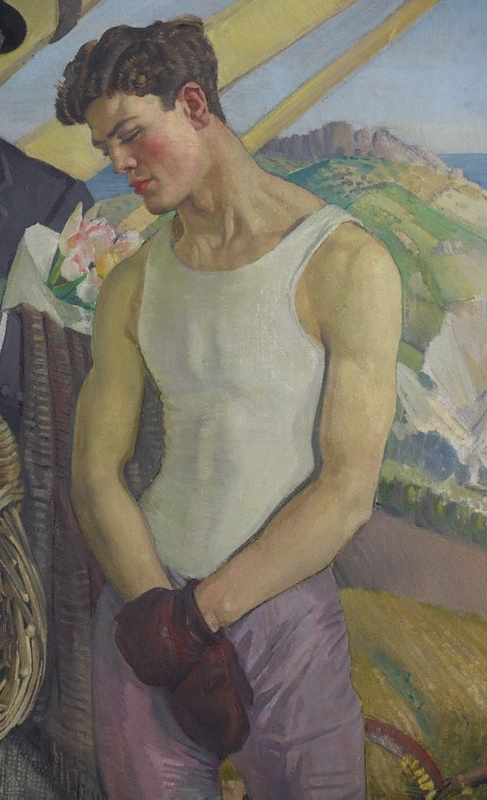 The Sydney morning herald , 'Society of Artists: the Spring exhibition', pg. 6, Sydney, 09 Sep 1921, 6. Editor Unknown (Editor), The Home: an Australian quarterly , Sydney, Sep 1930, back cover (colour illus.). cover design by the late G.W. Lambert, A.R.A., front cover shows the work 'Head of a girl' also by Lambert. 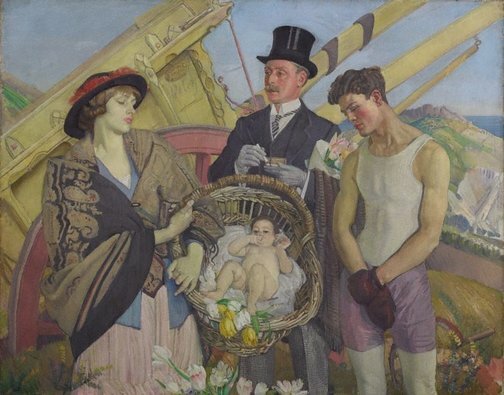 The Sydney Morning Herald , 'George Lambert. Purchases of His Works', Sydney, 23 Sep 1930, 4.